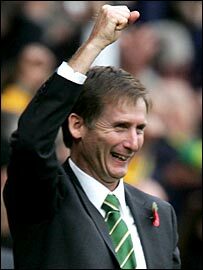 New Norwich boss Glenn Roeder saw his side fight back from two goals down to secure a draw against Ipswich. The visitors took the lead on 27 minutes when Alan Lee fired home from 12 yards before Pablo Counago scored from a simple tap-in from close range. But the Canaries hit back on 54 minutes when Ipswich's Owen Garvan deflected in Martin Taylor's header before Jamie Cureton equalised with a deft chip. Norwich's Darren Huckerby was sent off for a dangerous tackle in injury time. Although the result keeps Norwich rooted to the bottom of the Championship table, the second-half performance in an entertaining East Anglian derby will give Roeder plenty of encouragement as he attempts to lift the club from the relegation zone. Roeder opted to utilise the experience of Dion Dublin up front and the former Manchester United striker almost put his side in front on seven minutes but was denied by a brilliant save from keeper Neil Alexander. Ipswich took the lead thanks to a route one ball from Alexander, neatly flicked on by Lee to Counago, whose return pass set up his strike partner to fire past David Marshall. And Spaniard Counago doubled the lead on 40 minutes when he was presented with the simplest of tap-ins from a Billy Clarke cross. But Norwich hit back after the interval thanks to Taylor, making his first appearance since joining on loan from Birmingham City, whose header took a sharp deflection off Garvan to beat Alexander at his near post. The goal galvanised Norwich and the equaliser duly came when Cureton, who had missed two excellent first-half chances, lobbed Alexander with a deft chip with the outside of the boot for his first goal in 11 games. The assistant referee's flag came to Norwich's rescue on 69 minutes when Lee was adjudged offside from a free-kick. The game continued to ebb and flow as both sides pushed forward in search of a winner in the final 20 minutes. And it was Ipswich who came the closest to snatching three points when Danny Haynes was denied by a brilliant save from Marshall five minutes from time. The game came to an anti-climatic end when Huckerby was red-carded by referee Rob Styles for showing his studs attempting to tackle Jonathan Walters in injury time. "To lift the ball over the goalkeeper like that was a goal worthy of the very best. It was Premier League finishing. "But it wasn't satisfying that the effort didn't give us three points because I thought we were the better side throughout. "But we have to play with that level of intensity every match now. They've set the benchmark." "If we'd defended properly we would have won the game. "We were a bit lucky to be 2-0 up at the break but it could have been any score, there were so many chances at either end. "Neil Alexander kept us in the game with some top saves. He's getting better and better and his confidence is getting better every week." Norwich: Marshall, Otsemobor, Shackell, Taylor, Lappin, Chadwick (Croft 76), Brellier, Russell, Huckerby, Dublin (Hartson 46), Cureton (Smith 82). Subs Not Used: Gilks, Murray. Goals: Garvan 56 og, Cureton 67. Ipswich: Alexander, Wright, Wilnis, De Vos, Harding, Walters, Garvan, Legwinski (Haynes 75), Clarke (Roberts 82), Counago (Trotter 74), Lee. Goals: Lee 27, Counago 41.